Just a few minutes ago, we reported on Mark Waid, arguably the biggest Superman fan in comics, and his heartbroken take on Man of Steel--well, this morning we've got a bit of an antidote for you in the form of Chris Haley, co-creator of Let's Be Friends Again and closer runner-up to Waid's "biggest Superman fan" title. "I don't care if the Superman flick is good or not. 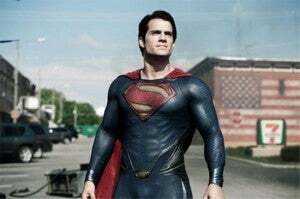 I just want Chris Haley to be okay with it," tweeted former Superman writer Chris Roberson earlier tonight--so what did Haley have to say about the film? Here's an excerpt from his Twitter account. My phone died as April was trying to record a video of me crying after Man of Steel. I only kind of welled up a few times during the movie. When it was over, I was kinda surprised by this. I sat thru the whole credits & then went to the restrooms. I started thinking about what I was going to tweet. While standing at the urinal & wondering what to tweet, the theme started playing in my head & all the emotions hit me. I managed to keep it together long enough to get out of the bathroon and into an empty hallway before I started SOBBING. April asked if I was crying or laughing and I said both as a puddle of tears was forming in my glasses. She asked if i was ok, & I struggled to compose myself enough to say "I'm so happy." Anyway, I'm not gonna spoil anything or say anything about the movie itself for a while, but my 2nd viewing starts in 30 minutes.